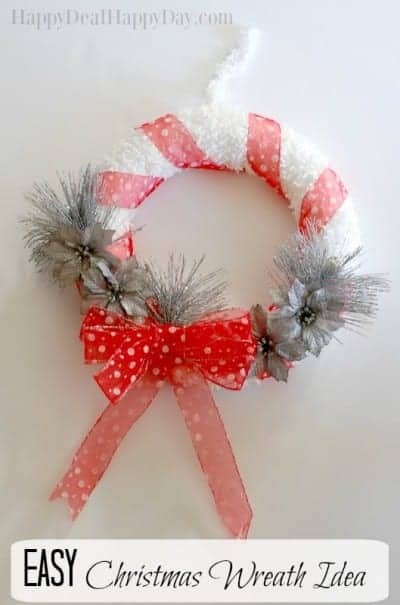 DIY Christmas Decorations | Christmas Wreath | Happy Deal - Happy Day! Christmas season is in full swing! 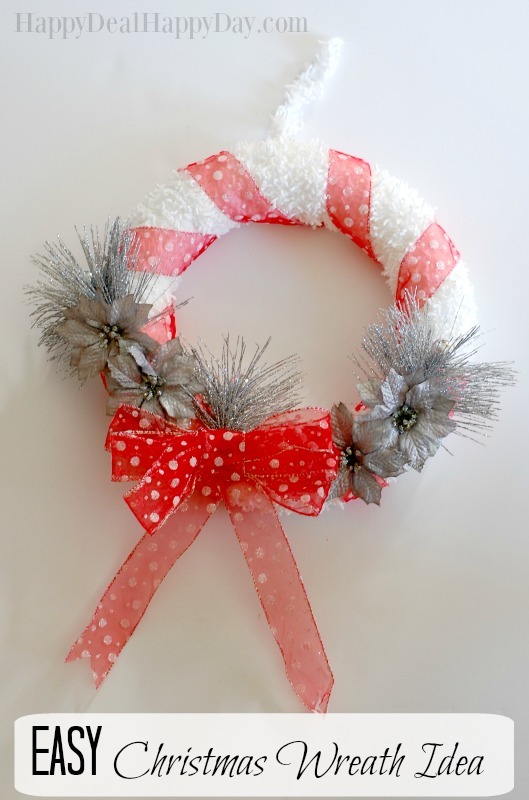 I couldn’t help but add a new Christmas wreath to my DIY wreath collection! 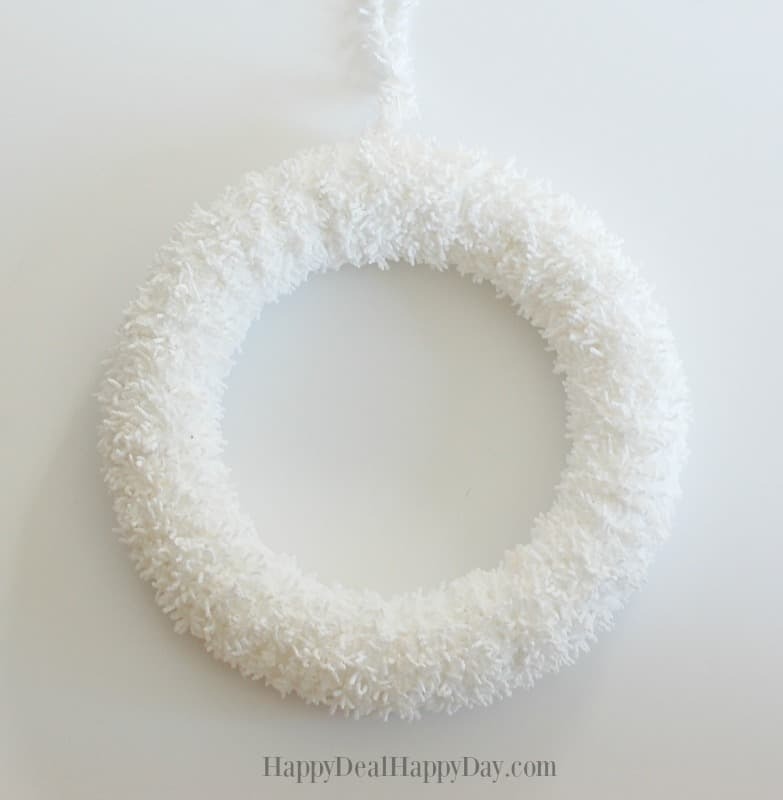 My styrofoam ring was white, which made it easy to cover up with white yarn. But if by chance you have a green one, you may need a few layers of yarn to cover up the green color. I suggest using plain white yarn first and wrap a couple of layers around the ring with that first. Then you’ll just need one layer of the tizzy yarn. Tizzy yarn is more expensive that normal yarn, so this is a frugal way to get it fully white without using as much of a more expensive material. After the ring is covered in yarn, I then added Christmas ribbon around that and secured it with hot glue. 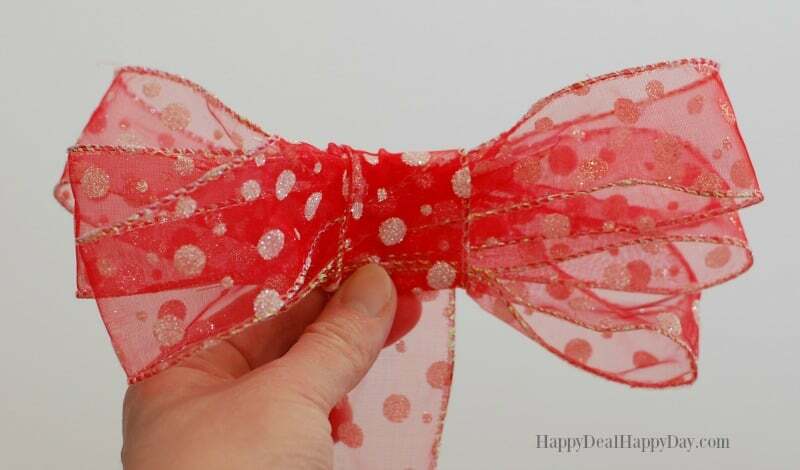 Frugal Crafting Tip: Stock up on Christmas ribbon after Christmas each year! All of the materials I purchased for this, were actually purchased last year. I LOVE hitting up Joann Fabrics and Michaels right after Christmas and snagging up some amazing Christmas craft materials for 75% off! I always have a large variety on hand so that I can experiment with projects like this one. I grabbed one of the Christmas ribbon spools I had and made 3 loops back and forth to create 6 loops. Then I took the ribbon and wrapped that around the center and cut and hot glued it closed. Instead of trying to tie a fancy bow, I always make the looped part separate and then just glue on the tails. 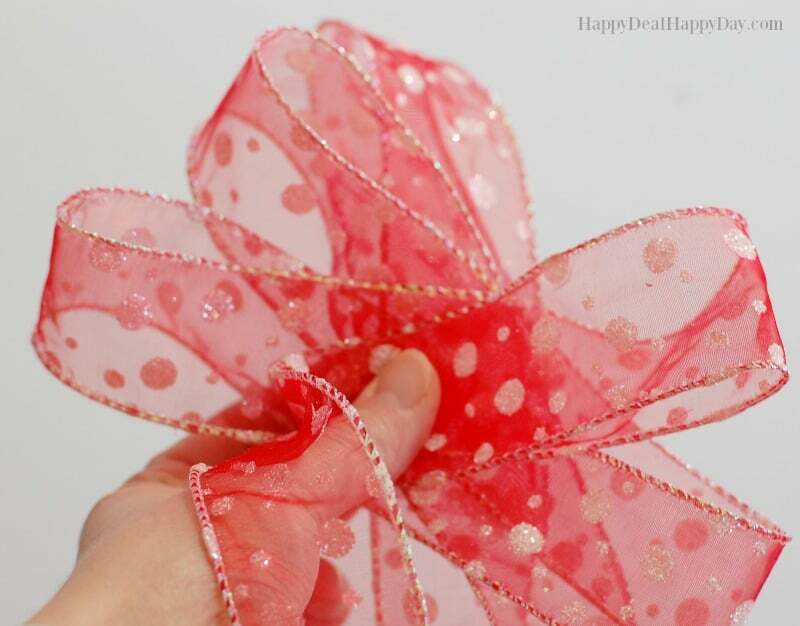 No one needs to know that the ribbon is not just one long piece that is tied in a magical way. Glue on the tails so they are even and flat. Then turn it around so the glued tails are on the back, and then glue on the whole ribbon on to the wreath! I also added some silver poinsettias and other silver sparkly picks, all with a glue gun. Keep this project in mind for your Christmas clearance shopping this year – stock up now for fun projects next year! Looking for more Christmas seasonal ideas? 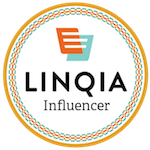 Check out these posts that I bet you will like! 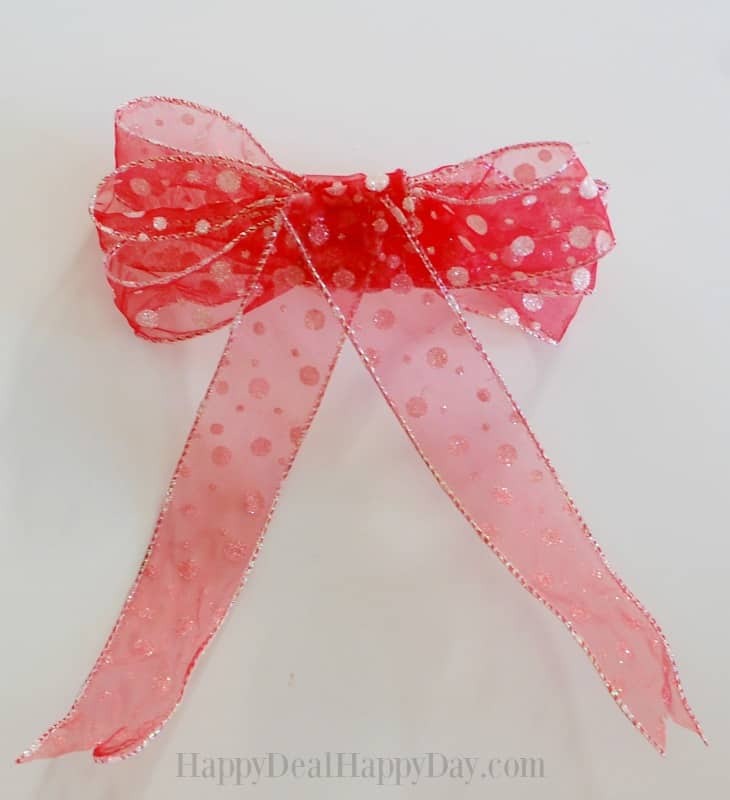 ← Amazon: 9 Pieces Baby Girls Cute Flower Headbands for just $4.99 + Free Shipping! That’s just $0.55 each!